Gov. 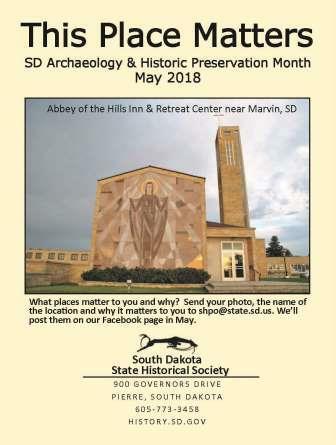 Dennis Daugaard has proclaimed May as Archaeology & Historic Preservation Month in South Dakota. The month “acquaints the public with the disciplines of archaeology and historic preservation and strengthens the enduring bond between the past and the present,” Gov. Daugaard said in the proclamation. Historic Preservation Month has been celebrated in South Dakota since it was established at the national level in 1973. The state added archaeology in 2005 to recognize it as a partner in historic preservation. The 2018 theme for the month is “This Place Matters.” Vogt encourages South Dakotans to take an interest in locations that are special to them. People are invited to consider why their place matters and how it can be preserved for future generations. This year the State Historical Society sponsored a statewide essay contest for all students in the fourth grade, the year in which South Dakota history is taught. The purpose was to enable students to achieve a better appreciation of their historic resources, the stories they tell and why they should be maintained. Students were asked to write a 100-400 word essay about any South Dakota location that is at least 50 years old, why it is a favorite place for them and why it should be saved. It did not need to be a historic site. Entries were judged on quality of writing, content and theme, and originality of thought. There were 50 entries from across the state. Winners of the contest were as follows. The first place winner was Makena Jutting from Tea Area Legacy Elementary School. Makena’s essay entitled “The Heart of Sioux Falls” was about Falls Park. She won a $100 cash prize and a one-year family membership to the South Dakota State Historical Society (a $50 value). Josie Spiering from Webster Area Elementary School took second place. The place that mattered to Josie was her grandparent’s farm in Day County. She won a $50 cash prize and a one-year family membership to the State Historical Society. Winning third place with a story about the Ingalls homestead in De Smet was Kyla Peskey from Holy Trinity Catholic School in Huron. Kyla won a $25 cash prize and a one-year family membership to the South Dakota State Historical Society. A link to the winning essays can be found on the State Historical Society’s website at history.sd.gov/preservation/archhpmonth.aspx. Activities across South Dakota are listed on the State Historical Society’s online calendar of events at history.sd.gov. This calendar highlights educational programs in the areas of archaeology, preservation and history across the state and beyond throughout the year. Those interested in submitting an event to be posted on the calendar can find a form on the website calendar page. For more information on this annual celebration or other historic preservation programs, contact the State Historic Preservation Office at the Cultural Heritage Center, 900 Governors Drive, Pierre, SD 57501-2217; telephone 605-773-3458, e-mail shpo@state.sd.us, or website history.sd.gov/preservation. The South Dakota State Historical Society is a division of the Department of Education. The State Historical Society, an Affiliate of the Smithsonian Institution, is headquartered at the South Dakota Cultural Heritage Center in Pierre. The center houses the society’s world-class museum, the archives, and the historic preservation, publishing and administrative/development offices. Call 605-773-3458 or visit history.sd.gov for more information. The society also has an archaeology office in Rapid City; call 605-394-1936 for more information.